Written and directed by Mike Leigh [Secrets and Lies], Happy-Go-Lucky reminds me a lot of Voltaire’s Candide with a protagonist who enters every situation thinking that everyone is wonderful and no one is dishonest or hurtful. However, Poppy [Academy-award nominee Sally Hawkins], a North London schoolteacher, is much less naïve than Candide. She knows about the world and its darkness. She just chooses to ignore the evils most of the time. Poppy remains the ultimate optimist regardless of the situation she finds herself in. She shares a flat with a friend, makes little money as a school teacher, and has not had a date in quite some time. What may be routine to some proves comfortable to Poppy. She and her roommate Tash [Sarah Niles] have lived together for a decade and each weekend, they frequent the same bars and clubs. Poppy never appears bothered that she’s single. In most films, if there’s a single gal, inevitably, there comes that scene where the woman breaks down and eats junk food or stays in bed for days to portray social inadequacy. Poppy just goes on with it and enjoys her friends and her sister and her job. In the first few minutes of the film her bike is stolen and she laughs it off and decides to learn to drive a car. When a boy at school seems to be having problems, Poppy deals with it in stride and ends up meeting a cute social worker. The main drama in the film comes during her driving lessons with an angry, bigoted man who develops a crush on a blissfully unaware Poppy. At times her lessons get downright nasty and on several occasions Poppy finds herself in true danger. Despite the urgings of her roommates to report her driving teacher to the police, Poppy deals with him on her own unflappable terms. 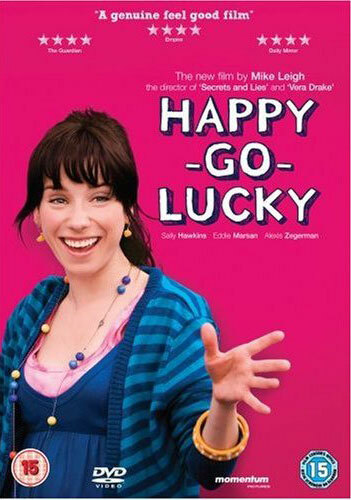 Sally Hawkins plays bubbly from head to toe with this character. Poppy never gives up. We never see a moment where she’s not smiling or glimmering. It takes remarkable acting skills to consistently play this happy, this content, and this resolutely optimistic. In the end, Poppy is not a caricature but is a fleshed out and credible person. Poppy’s not too sugary, but just right in her sweet demeanor and charming in her persona. She’s not beautiful but lovely. We can easily share in the journey with Poppy. Nothing keeps Poppy from persevering and that’s what makes this character adorable and intensely likable. She cares deeply for the contentment and welfare of those around her. It’s such an admirable trait. She’s faithful and true and honest. There’s nothing sappy about Happy-Go-Lucky. Films about spirited, well-intentioned individuals are few and far between. It’s nice to go to the theatre to escape into Poppy’s world of sunshine and smiles and feel like you’re getting hugged. Mike Leigh has created a genuine treasure in Poppy and Happy-Go-Lucky is a joyous film. This entry was posted on November 13, 2010, 22:59 and is filed under DVD, Film. You can follow any responses to this entry through RSS 2.0. Both comments and pings are currently closed.